Palomar Skies a blog with news and information about the Palomar Observatory. Postings here will cover current research, history and public outreach events taking place at the observatory. Rudolph Minkowski, after a long and distinguished career in astronomy, had his last night of observing on Palomar's 200-inch Hale Telescope on March 29, 1960. 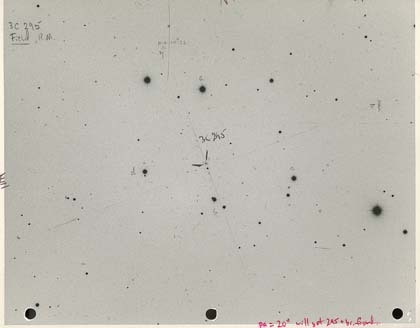 It proved to be a good night as he measured the distance to the central galaxy in a cluster of galaxies known as 3C295. With a redshift of 0.46, 3C295 held the record as the most distant known galaxy cluster until 1975. How far away is it? About 4.8 billion light years. Modern electronic detectors are much more sensitive to light than the old photographic plates used by Minkowski and others and as such galaxies of vastly greater distances are now known making Minkowski's find seem almost close.